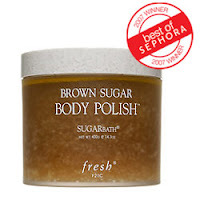 As you can see from this picture, the Brown Sugar Body Polish by Fresh won the 2007 best of Sephora award for being such a wonderful scrub. I agree that this body polish is just terrific! This scrub contains real brown sugar- how great is that? So you have real brown sugar, jojoba oil, sweet almond oil, apricot kernels (though you can't tell that it includes apricot kernels), ginseng and a few other natural ingredients. The grains are a bit hard but the oils help to soften the blow. If you do not emerge from your bathroom with silky soft skin after using this scrub, I just don't know what to tell you. This is a natural product and it smells sweet too. What more could you ask for? Before I give you the price let me tell you that the jar is pretty big (14.1 oz), and remember it is a natural product so it is worth the $62.50 price tag. Which scrubs do you love? i am a big fan of all the origins scrubs. I enjoy Sabon body gel polisher. I am not familar with Sabon I will have to check it out. Girl, you do any drug store pimpin'? That scrub sounds great. Pricey, but great. Sounds nice but $62.50 is alot for a natural sugar scrub. I use a body & manicure scrub from SugarLicious. It's very nice. Thanks for the info Penny I have to check out Sugarlicious. No time for a vacation? I HATE the smell of Flowers!